Well the massive “weather bomb” which was set to hit us was enough to cancel the Ironman but I thought it may have been more. It certainly had an effect on our backcountry rivers with most systems being unfishable for a few days which meant for a couple of cancellations unfortunately. The local mountains have got a good covering of snow after low temperatures last night which is a sure sign that ourÂ summer was hopeless and the seasons are changing. It was disappointing today to only hear a few Cicada’s so I will assume that we have seen the last of those for another year. Before the bad weather arrived I had a good day in the backcountry with over 20 fish caughtÂ by Bill who was travelling from the USA. 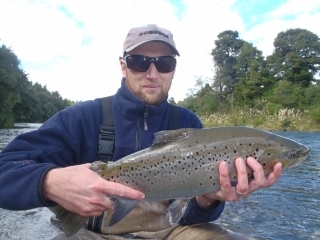 Â Bill is a very young, strong, skillfull angler which made the most of our great summer fishing while on his honeymoon, goodluck with that one. ItÂ was nice to see and hook alot of smaller fish in the system this time which are great sportÂ as they have so much energy as maiden fish, fish weighing between 1lb and 2lb. Exciting times just ahead for our local rivers as I think the early spawning rainbows are very close to start to push through whichÂ mixed in with trophy browns give us some awesome targets in the next few weeks. Our weather bomb has hit the river mouths with some huge waves which has pushed fresh fish into the rivers. 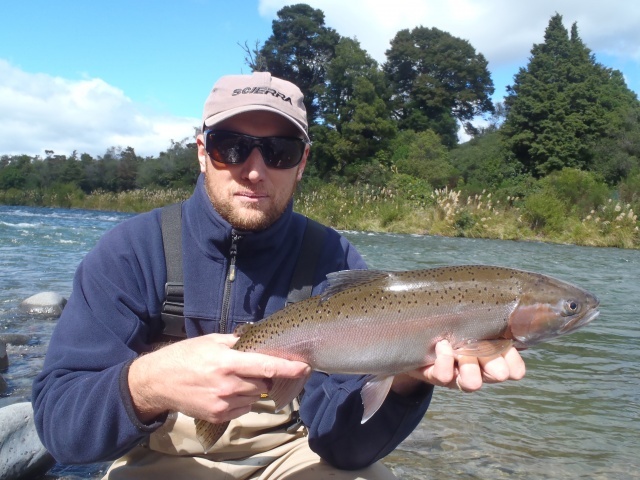 The Waitahanui has seen the first good rainbows go through and some brave anglers were able to hook these beauts in the lower river. The first to run here are usually the solid jacks which we all like to catch for the smoker as they are so well built and will generally have orange flesh which is best for eating. Anglers will do well picking these up while conditions allow at the mouth of the river or in the lower river as they enter.Â Â Â Most anglers are very excited about the winter fishing this season as the boat anglers have had a great summer with well conditioned trout which are 100% better than the past few seasons. Lake O fished well over the weekend with plenty of anglers lining the banks of the inlet canal as the water cleared late on Sunday. If the canal here becomes dirty it almost will always fish very well with fish entering from the lake to feed on all the food which is being washed through from supplying rivers. 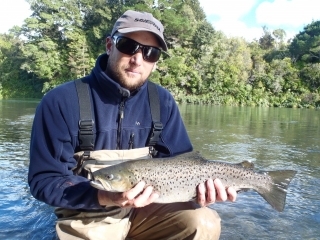 Some great fish have been caught this season especially this late in the summer after a few months of having plenty of different food options to choose from like, Cicada’s, dragon fly, snail’s, damsyl nymphs and water boatmen. 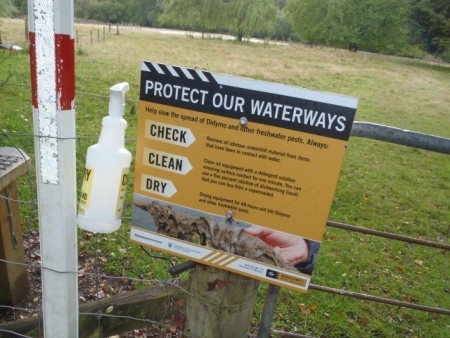 Releasing fish here is advised as they have no real eating quality compared to Taupo fish. This morning I fished with Sean onÂ a quick half day on the mighty Tongariro. Sean works locally here in Taupo and has been keeping a keen eye on the website over the summer months and finally made the move to be shown how to catch some of our smart browns. I usually dontÂ take requests but Sean seemed like a good guy who just wanted to learn about where to look for them, how to approach themÂ and maybe have a chance to cast at one or two in the hope he catches them on a good day. Today was the perfect opportunity to land one of these willy brownies and Sen really stepped up and made the most of a golden opportunity. 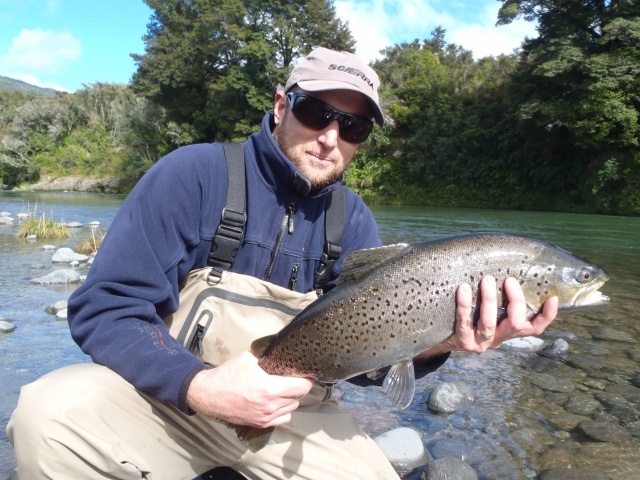 The river has been flowing quite hard for the last few days which would have encouraged more fish to run up from the lake but also probably slowed their feeding ability down a bit until the water cleared a little. This morning it was running at about 40 cumecs and clearing quick so it was perfect to try and find feeding fish which would have their defences down and give Sean a good chance of catching the much sought after andÂ usually elusive brown trout. Well they certainly had their defences down and their silly caps on as Sean did’nt just get to catch one but he ended up with hooking five, landing four and topped it off with a solid fresh run rainbow. 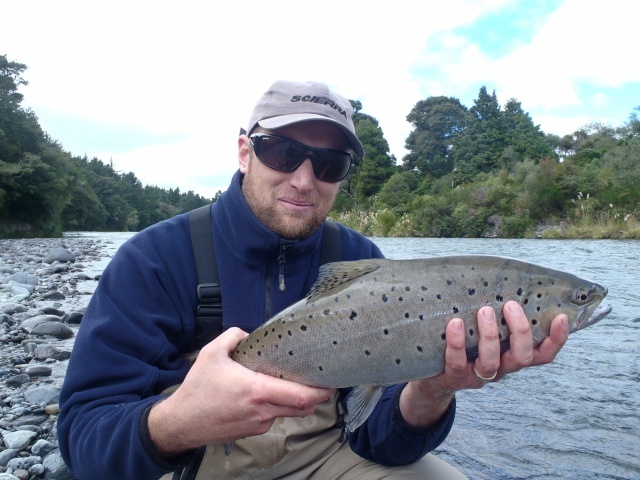 I must admit itÂ is not often the elements line up and create the perfect fishingÂ conditions and it was probably the best half day result I have been involved with when targeting brownies in the TongariroÂ but with Sean’s casting ability , water clarityÂ , hungry trout and a little guidance the perfect morning came together. All fish were caught on a nymph called a Quasimodo fished behindÂ a heavier front fly depending on the water depth. TwoÂ of the brownies we caught we spotted first then cast at but the other three were picked up blind nymphing in a run which is usually productive for me. There is no doubt the slightly dirty water helped us and put the fish into a good mindset to feed. I know all these fish look the same but rest assured theyÂ are very different individual fish with personalities, kinda why I love catching them.Â These fish ranged from about 5lb through to about 7.5lb and have just pushed up from the lake as they are very silver and in amazing condition. What beautiful spots! !Â Sean should really take up another sport now as it will be a while before a similar phenomenon appears again for him, well done mate and stay away from my fish.